TechFreeHelp is the PUP that uses misleading techniques to prevent removal. Use Reimage to locate malicious components and get rid of them faster than with uninstall instructions. A full system scan blocks virus reappearance and prevents traffic to malicious domains. What do appearing TechFreeHelp ads tell you about the PC? When did the adware appear on my PC? 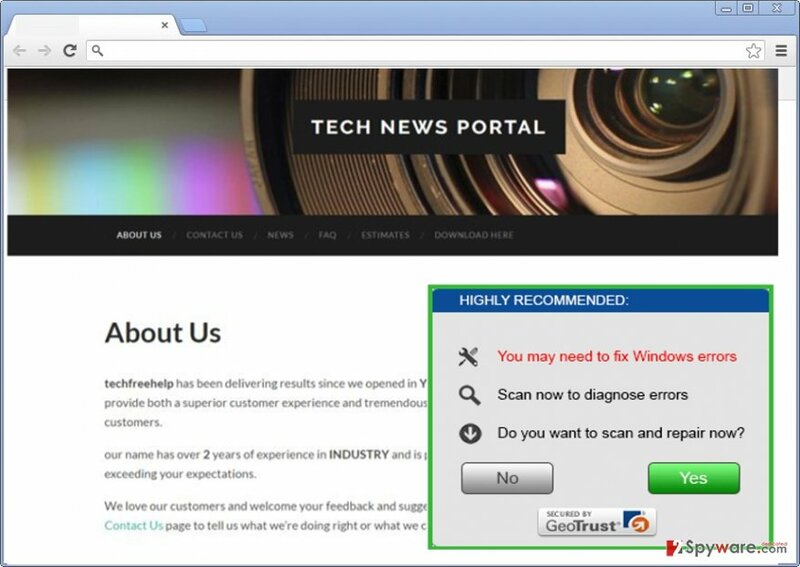 A number of various distractors, i.e., advertisements, banners, etc., suggest that TechFreeHelp virus took a liking of your computer and infected it. Surprisingly, you might not suspect that the adware-type application has invaded the computer until the pop-ups become a real burden. Though this adware is not particularly damaging, you should not delay TechFreeHelp removal procedure. Otherwise, diverse commercial offers will cram your online screen. What is more, the program might also install other unwanted and hardly practical tools. It would be better to remove TechFreeHelp from the device at once. Though the title of this fishy program offers you free services of a tech support specialist, it is highly questionable whether you will truly receive aid. Such adware type programs tend to promote cheap tools or software. Frequently, it might be a scanner or a PC optimizers. Do not get tempted to install any product promoted by Tech Free Help application. There is a risk to install a futile or a malicious application. 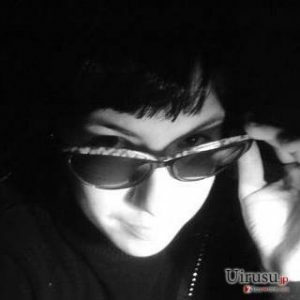 In addition, the PUP spies on your browsing activities by collecting information about visited domains. Later on, this data might fall into the hands of advertising companies. After processing the data, they are likely to bombard your computer with customized advertisements. Therefore, eliminate the adware with the help of Reimage. The PUP tends to infiltrate computers using freeware as a disguise. It does so by clinging into free applications under “Basic” settings. You can detect similar PUPs when you opt for “Custom” mode. It discloses all optional programs. Even Java or Skype applications often come with an unwanted “packages.” Therefore, you need to be vigilant and careful while conducting the installation. You should not let your guard down even on a legitimate website. Thus, when you start installing a new application, opt for the previously mentioned settings and unmark all unnecessary attachments. Cautiousness will help you escape TechFreeHelp hijack. You can easily remove TechFreeHelp with the help of an anti-spyware application. What is more, it is apt in detecting even a minor potentially malignant file. The software also works perfectly while eliminating such cyber threat as ransomware. The automatic TechFreeHelp removal does not take long. On the other hand, there is also an alternative solution. You can get rid of TechFreeHelp virus manually. The instructions are delivered below this article. They will also help to clean your browser from any secretly infected adware scripts. Here, look for TechFreeHelp or any other recently installed suspicious programs. Wait until you see Applications folder and look for TechFreeHelp or any other suspicious programs on it. Now right click on every of such entries and select Move to Trash. When in the new window, check Delete personal settings and select Reset again to complete TechFreeHelp removal. Once these steps are finished, TechFreeHelp should be removed from your Microsoft Edge browser. Here, select TechFreeHelp and other questionable plugins. Click Remove to delete these entries. Now you will see Reset Firefox to its default state message with Reset Firefox button. Click this button for several times and complete TechFreeHelp removal. Here, select TechFreeHelp and other malicious plugins and select trash icon to delete these entries. Click Reset to confirm this action and complete TechFreeHelp removal. Here, select Extensions and look for TechFreeHelp or other suspicious entries. Click on the Uninstall button to get rid each of them. Now you will see a detailed dialog window filled with reset options. All of those options are usually checked, but you can specify which of them you want to reset. Click the Reset button to complete TechFreeHelp removal process. This entry was posted on 2016-09-05 at 06:47 and is filed under Adware, Viruses. You can quickly scan the QR code with your mobile device and have TechFreeHelp ads manual removal instructions right in your pocket. How did you remove TechFreeHelp ads?